Fitoor is a Bollywood romantic drama film directed by Abhishek Kapoor and produced by Siddharth Roy Kapur and is based on Charles Dickens' novel Great Expectations. The film stars Aditya Roy Kapur, Katrina Kaif and Tabu in leading roles while Aditi Rao Hydari, Rahul Bhat, Akshay Oberoi, Delbar Arya, Lara Dutta, Tunisha Sharma, Suchitra Pillai, Andy Von Eich, Govind Namdev, Ajay Devgan plays a supporting roles. 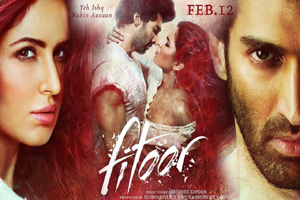 The soundtrack of the Fitoor is composed by Amit Trivedi and lyrics were penned by Swanand Kirkire. Here is the link of all the songs lyrics and videos of Fitoor.